Bufford has found the "love of his life" by usin a datin' app thingy. But his kin, have their doubts. They done tagged along to make sure she aint no gold digger. Mystery ensues. Enjoy a great dinner and a fabulous Mystery Theater show all at the same time. Please make reservations by calling the restaurant at 937-461-3913. Reservations are required. The price includes, soft drink, salad, entree, dessert, and the show. Tax and tip are not included. 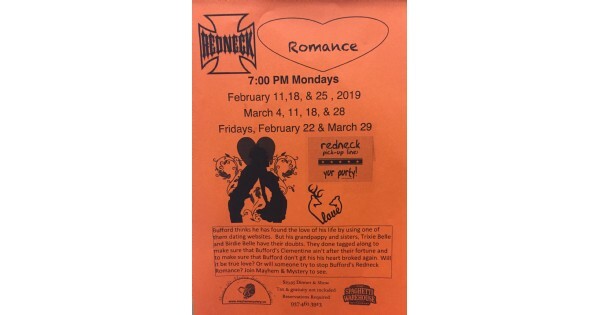 Find more events like "Maythem & Mystery: Redneck Romance"
Mayhem & Mystery presents weekly interactive mystery shows at the Spaghetti Warehouse. For over 30 years, the Spaghetti Warehouse has combined old world Italian traditions with a festive atmosphere, large seating capacity and more than 21 locations in 9 states.